Our mission at Westside Montessori School is to nurture and educate every child to meet her full potential. 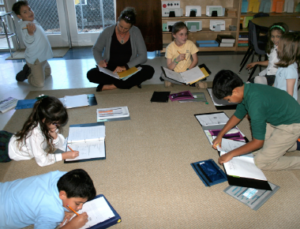 WMS operates with fidelity to the Montessori philosophy and principles. The school is designed to ensure safety and nurtures a rigorous, caring, and supportive environment. 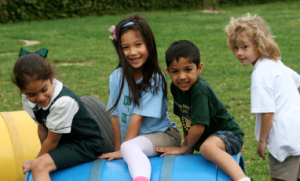 Westside Montessori School was founded in the spring of 1977 by a small and committed group of parents. Their goal was to create another option for parents to consider educating their children that would nurture student empowerment, curiosity, and independence. They established a parent cooperative affiliated with the Association Montessori Internationale (AMI) and the American Montessori Society (AMS). Through hard work, persistence, as well as the engagement of the community, the school opened its doors for the first time on September 6, 1977, bringing the Montessori Method of education to the community. After more than 40 years of development, Westside Montessori School is nestled on a beautiful 4-acre wooded campus in west Houston, and currently serves toddlers through 8th grade. The school has stayed true to its founders’ mission and vision while moving far beyond its two-classroom beginnings to become a multi-facility campus that serves over 200 students. We boast phenomenal parent support of time, talent, and funds, in addition to outstanding staff that deliver exceptional Montessori education. 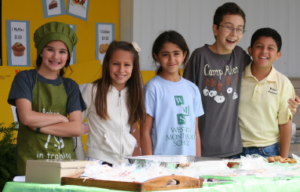 WMS strives to offer a pure form of Dr. Maria Montessori’s educational philosophies and methods to our students. The Montessori approach nurtures the whole child and by doing so helps to create a centered being with confidence and compassion for the world around her. Guided by Dr. Maria Montessori’s wisdom, WMS prioritizes creating a favorable environment that will encourage the flowering of a child’s natural gifts by removing all obstacles. This environment is the foundation for all future education. Westside Montessori School is a Full Member of the American Montessori Society. We are accredited through AdvancEd. At the close of the 2017-2018 school year, the school reached an all-time high enrollment of 215 students. 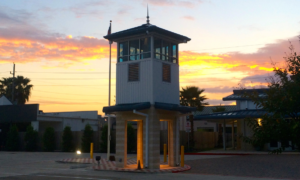 Students find their way to WMS as residents of our surrounding neighborhoods, but are also drawn to our doors from the greater Houston area based on our reputation for excellence in Montessori education. The diversity of our students and their families are at the core of what makes WMS so unique and exceptional. It is through our multi-cultural, multi-lingual student population that our true identity is achieved. Our families come for all over the world and represent over 30 countries. 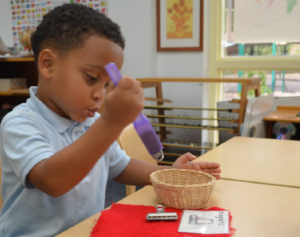 We celebrate our international array of scholars that unite under one roof for the purpose of developing the whole child through Dr. Maria Montessori’s teachings. 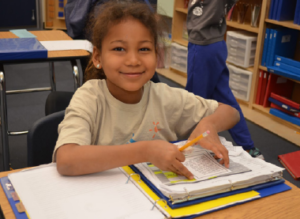 This spring, the Board of Directors and Head of School announced to our families that the school is preparing to expand its program offerings to include a Montessori adolescent program. The new adolescent program will begin in the fall of 2017. Based on a thriving elementary program, and clear parent support and demand, the leadership decided to more completely meet the educational needs of our students by expanding to include the three-year adolescent cycle. This is a natural progression for our program and fits into the long-range planning of the school. WMS is a non-profit 501(c)(3) corporation funded by tuition, fees, and donations. 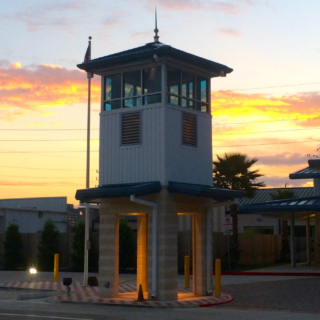 WMS balances its operating budget annually, and has healthy reserves. • Tuition income and fees cover 100% of the core operating expenses. • The Spring Annual Gala, held in April 2016, raised just over $44,000 in net proceeds. staff appreciation days and collect monetary gifts for staff before the winter break. The school community prides itself on working together for the benefit of the children and staff. There are opportunities for all who want to be active in their support of the school, and the closeness of our families is founded upon the shared responsibility for ensuring success of the school, just as those who came before us did so selflessly. The school values are centered around quality, both in the loving and nurturing programs that the children receive and the materials with which they work and play. This is the hallmark of Westside Montessori. This goal motivates the staff and parents in all their endeavors. WMS offers an education to children ages 18 months through 6th grade. Our academic workday for toddler and younger primary students is from 9:00am-noon. Those primary students that are ready will be offered an extended academic day ending at 2:30pm. Elementary academic programs run from 8:30am-3:00pm. Extended care is offered to meet working families’ needs with extended day and full-day options available. Fullday care for children is available from 7:00am-6:30pm. There are currently waitlists for all programs. is a prepared environment which provides for the physical, psychological and developmental needs of the child under three. 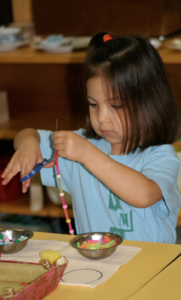 The materials used provide the child the opportunity to learn through movement and exploration. 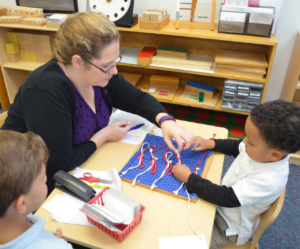 At Westside Montessori emphasis is placed on gross and fine motor skills, sensorial, language and social development. Toilet training is part of the program. The environment is arranged specially for, and corresponds to, the growing developmental needs of the child. is based on the three-year cycle, with the third year serving as the culmination of the preparatory work during the first two years. This results in exciting leaps in reading, writing and math concepts. The student brings together practical life and sensorial experiences in botany, geometry and geography to an intellectual level of conscious understanding. is broken up into two 3-year cycles beginning in lower elementary (grades 1st-3rd) and continuing to upper elementary (grades 4th-6th). The elementary program offers an exciting research style of learning where children work in small groups on a variety of projects, which spark the imagination and engage the intellect. Lessons given by Montessori teachers direct the children toward activities which help them to develop reasoning abilities and life skills. At this age, the appetite of children to understand the universe and their place in it directs the elementary work. Elementary studies include geography, biology, history, language, mathematics, science, music and art. Exploration of each area is encouraged through trips outside the classroom to community resources, such as a library, planetarium, botanical garden, or science center. This inclusive approach to education fosters a feeling of connectedness to all humanity, and encourages their natural desire to make contributions to the world. The Elementary children take an annual two-night, three day field trip to Camp Allen located in Navasota, Texas. The students are accompanied by the teachers as they gain confidence in their time away from home and explore the great outdoors. Activities such as hiking, canoeing, rock-wall climbing, horseback riding, archery and fishing are enjoyed. The children come home with memories that last a lifetime and with a longing to return. The Montessori teachings encourage this level of time spent observing nature and the importance of reliance on peers and self to further develop the individual. 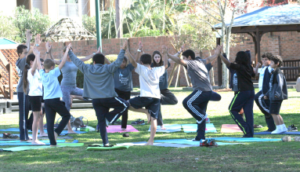 Spanish, music, physical education, and yoga are presented to the student during the school day. Extracurricular Programs Dance, drama, gymnastics, tennis, karate, and art are offered at a fee to children after school. WMS offers a summer program for all levels, though it is not part of the official academic year and is optional for students to attend. 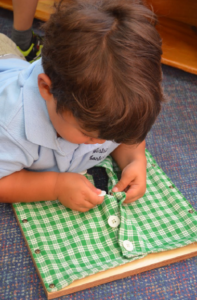 The Montessori teachings are enhanced with special themed programs for the different weeks. This is a time for teachers to go beyond the daily lessons and incorporate new, exciting activities to continue inspiring a love of learning in the children. Our students are proud to participate in different service projects throughout the year that allow them to discover the joy of volunteerism and importance of serving the larger community. 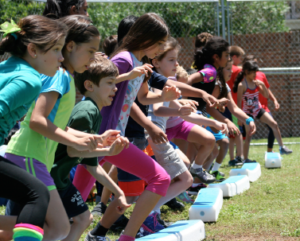 Students have participated in fundraising and given of their time for events such as Lemonade Day, book drives, coat drives, sale of school-made crafts, bake sales, and volunteering at the Houston Food Bank.